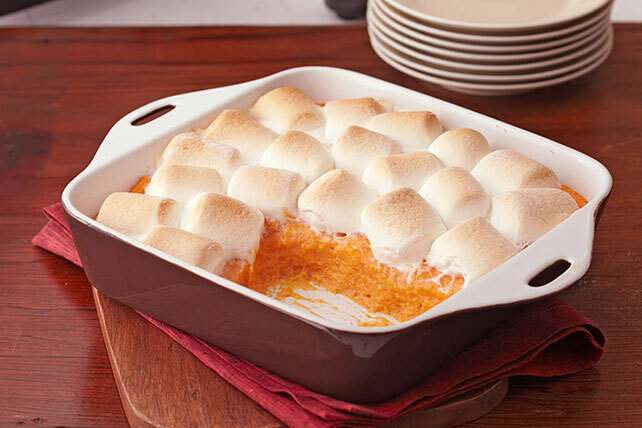 Sweeten up your holiday and serve this Baked Sweet Potato Recipe with Marshmallows. Your guests will love this Baked Sweet Potato Recipe with Marshmallows so much they may forget all about the turkey. Cook potatoes in boiling water in large saucepan 20 min. or until tender; drain. Mash potatoes. Add milk, cream cheese and sugar; beat until fluffy. Spoon into 9-inch square baking dish sprayed with cooking spray; top with marshmallows. Assemble recipe as directed but do not top with marshmallows. Refrigerate up to 24 hours. When ready to serve, top with marshmallows and bake as directed.